Here is what is included and what each part of our cash flow management software does for you. The best part is that it costs “less than a bank service fee” for one bounced check! 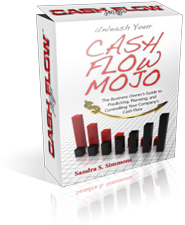 This cash flow software for business owners known as Cash Flow Mojo® is a combination of tools to assist any small to medium sized business to get their finances in order and become more profitable. Tell you exactly how much cash flow you need to bring in each week. Calculate how much weekly income you need to get out of debt and also achieve other financial goals. Highlight areas where expenses can be reduced without harming production and sales. Use a workable cash flow formula, if necessary, to get your company out of debt or expand your company without going into debt. Organize expenses efficiently so you can take actions to become more profitable. Show you exactly how much you can expect to increase sales each week. Act as a cash flow forecast tool to set sales targets. Develop a cash flow plan to collect the money that customers still owe you. Show exactly which products and or services should be advertised to generate the greatest profits. Generate a cash flow forecast to show how much income and profit each marketing campaign will generate. Give action plan steps to reach the income target, sales, and profits desired every week by your company. Show you exactly how much income is available for use in cash flow management. Stop overspending and overdraft charges in your bank accounts. Guide you to choose which bills and debts to pay each week. Assist you pay off debt faster and become debt free. Show you how to pay past due bills and still pay current bills. Guide you to accumulate money for upcoming large expenditures that are difficult to pay. Download the bills from versions of QuickBooks® – Or you can type them in manually. Keep you from overspending your budget or overdrawing on your bank accounts. Make sure you have adequate cash for payroll. Make sure you have enough money to adequately advertise and market your products and services. Allocate money to pay credit debt, past due bills, and current bills. Make sure you have cash savings to cover financial emergencies. Make sure you have cash set aside to pay taxes. Get cash put into savings for your long-term wealth building programs – often called retirement. Show which accounts to concentrate on in order to collect them. Tell you which accounts will not be collectible. Available to show you how to use this software program in less than 2 hours. Short step-by-step instructional videos to show you how to set up and use the Cash Flow Mojo software. Designed in a sequence so you can watch a short video, and then perform that step in the software. A live demonstration to show how each module is used. Designed so when you finish watching the videos you will be able to do your cash flow management in 20-30 minutes each week. Lets you know exactly what that word means that you just read or heard in the Cash Flow Mojo software program. Clears up the meanings of words so you can get the maximum benefit out of this program for yourself and your company. You are entitled to participate in monthly Group Coaching sessions with Sandra Simmons, the creator of the Cash Flow Mojo software. You can email your questions to the Cash Flow Mojo Team about how to use the software, or a specific cash flow problem you are having in your business and your question will be answered privately and, if appropriate, included and answered in the monthly coaching session – naturally your personal identity information will be kept confidential. Your question will get personal attention from International Expert Cash Flow Management Coach Sandra Simmons, creator of the software. Ask other businesses who their cash flow management software provider is and they’re bound to tell you that they use Cash Flow Mojo. Sign up for our 30-Day trial! See what others are saying about this cash flow management software system.